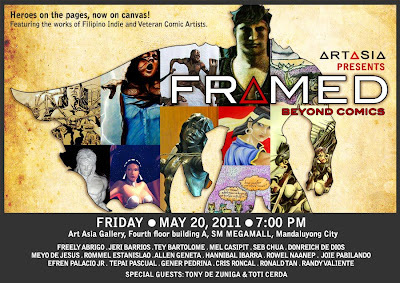 Art Asia Gallery presents FRAMED: Beyond Comics opening on May 20, 2011 at 7pm. This exhibition features the works of eighteen (18) Filipino indie and veteran comic artists. The heroes that we know and see in comic books are now on canvas. Some heroes are turned into magnificent sculptures as well. Exhibition runs until June 3, 2011.